The Boy has progressed quickly in his new troop. He quickly earned Tenderfoot and was elected Patrol Leader for the new boy patrol in our troop. He went to summer camp for a week in June in the Ozarks, along the beautiful Buffalo National River. Upon returning from camp, he said he didn’t take a shower the last few days, but he “was in the river for an hour or so each day, so that made up for it.” From the way he smelled, I would have to disagree. Perhaps needless to say, he had a blast at summer camp. I thought he might take a little break after summer camp, but he quickly earned Second Class in July, and he earned First Class in August. He slowed down a bit after that as school started, and since he moved out of the new boy patrol to one of the troops more permanent patrols, he was suddenly without a position of responsibility. It wasn’t until December that he was elected Patrol Leader for his new patrol (the youngest Scout in his patrol, but not the lowest ranked). So, his 4-month tenure for Star rank began in December. He’s earned five of the six merit badges he needs for Star, and the sixth is almost complete. So far, he’s earned (in order): Canoeing, Swimming, Indian Lore, First Aid, and Citizenship in the Nation. He’s almost done with Emergency Preparedness and hopes to finish that over Winter Break. He’s also started on the Environmental Science merit badge as his first step toward earning a Hornaday Award, which is something he’s been talking about since he first learned about the William T. Hornaday Awards. More on that as he progresses. Distinguished Eagle Scout Cliff Jacobson has a nice blog post on what he thinks a good survival kit geared toward the North Woods should be. There’s a lot of sound advice in there, and his list is probably appropriate for much of the U.S. that’s not desert or extremely swampy. 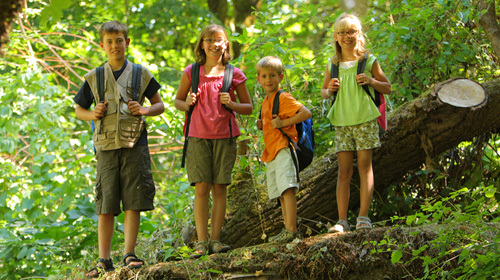 In the context of being a Scout Leader and a father of a really outdoorsy boy, I’ve spent a lot of time in the last several years studying (as a layman) the general area of “outdoor education.” It’s also often called “Adventure Education” or “Wilderness Education,” and it lies along the spectrum of experiential education. I’m especially interested in how that can lead to more people interacting positively more often with Nature. Garvey cites a study in which Outdoor Ed majors scored the highest of any major in terms of their moral reasoning ability (the ability to make ethical decisions). Does the outdoors draw people who are already inclined to be moral or ethical or is it something in outdoor education that creates or nurtures that in them? And though creating generally more people who are ethical and moral in their everyday lives is important, the essential things that getting kids exposed to Nature will do is create adults who will take action to preserve our wild spaces. A generation of kids raised on video games who’ve never been camping or hiking or swimming in a creek, or fishing, or hunting, or any other outdoor activities will not be the adults who write the legislation and the checks that help fight to protect our environment, both the wild places and where we live. Creating and nurturing ethical and moral behavior in Scouts is certainly a focus of Scouting, since the outdoors is just one of the methods of Scouting, whose main purpose is to help raise good citizens who are equipped to make moral and ethical choices as adults. (As an aside, I wonder how many of the subjects in that study were Scouts or former Scouts?). That time spent in the outdoors is a major part of the moral and ethical training of Scouts, I’d like to say that would be the case for non-Scouts, too, who spend a lot of time in the outdoors. Fewer and fewer children spent enough time in Nature these days. Scouting is a good organized way to make that happen, though there are other programs available for getting outside, too, and I’d certainly like to see more of them, and having more people involved in Outdoor Education — both professionally and as volunteers — will help that. 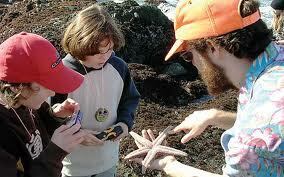 With a rise in Outdoor Education programs, hopefully more ethical people will get even more kids outside. The Boy finally crossed over to his new Boy Scout troop this past weekend. I say “finally” because he’s been caught in that weird world between Cub Scouts and Boy Scouts that is known as Webelos. It’s a fine line to walk, being a Webelos Den Leader. You have to give them more responsibility and do more — especially more outdoors — with them, but you can’t take them as far as Boy Scouts. And the Webelos program is entirely too long at 18-ish months. I think starting them at Tigers Cubs (now “Tigers,” sans “Cubs”) may make Cubs too long, but we have to get to them before sports gets them too deep and their families think they’re too busy to add Scouting, too. Like I said, it’s a fine line. Maybe the Cub Scout program revamp coming in 2015 will fix some of that. I think it’ll help. But, for us, it’ll be mostly academic, as we’ll be deep in Boy Scouting by then. The Boy did a good job of choosing his troop. Watching him hanging out with their older Scouts after the Crossover ceremony on Saturday night, I could already see how well he fits in with them. And I like the adult leaders, too. Some are from our old Pack, and some are new faces. All are great guys and leaders. I’ve been asked to be an Assistant Scoutmaster and accepted. Looking forward to figuring out my path to serving the boys of our new troop. The Boy earned his compass for hiking 75 miles with our Pack in the fall, so I wanted to get him a book on map and compass skills for Christmas so he could be learning the basics. I ended up getting him Basic Illustrated Map and Compass by Cliff Jacobson. The book is a solid introduction to map and compass reading and includes a short chapter on GPS, as well. I read it in a couple of sittings, and I enjoyed the refresher course (not having had to use my map and compass skills much in the last few years). I wanted a book that was short and concise, and I trust Cliff’s advice. I enjoy his no-nonsense, “here’s what’s worked for me for the last 30 years” type of writing. His Expedition Canoeing is the bible of wilderness canoeing, and he’s working on a new edition of it for publication in 2015. His Basic Illustrated Cooking in the Outdoors is the book I recommend to new outdoors cooks, too. The Boy will be learning map and compass skills on outings as he gets active with his new Boy Scout Troop starting on March 1st (our Webelos Crossover date). While he now has Cliff’s book and the Boy Scout Handbook, The Boy really thrives on learning by doing (“experiential education,” is the technical term), and he’s going to absorb most of this while doing it in the field instead of reading a book. But, books are still good for background and context.